Outstanding armchair from the Regence period, around 1730. Dimensions : 98 h x 64 w x 48 d cm. Original : private collection - Liege area (Belgium). 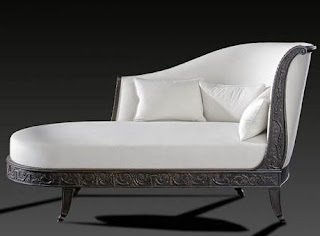 It is a pleasure to see the front rail in crossbow form, the bow-shaped splat, the fine, gracious carving of shells, foliated scrolls and foliage, and above all the legs ending in scrolls. All this emphasises the very high quality of the original. 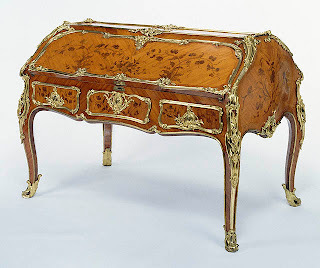 This type of chair was used both as a armchair de cabinet (at a desk) and as a salon chair; the height of the seat is also suitable for sitting at a table. 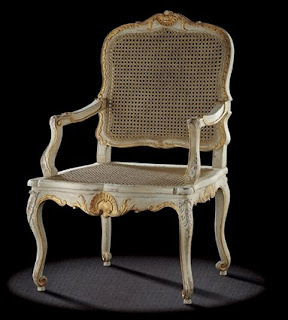 A slightly more recent armchair (around 1740), arbalete-style, with more lively carvings (palms and rocaille elements) and curves, but with a moulding from the early Louis XV/ Rocaille style can be seen at the Musee Conde at Chantilly, and appears to have similar dimensions.